Cutting Edge Hockey Development Centre features a 50’ x 120′ real ice training rinks that is an ideal size for the small group, personalized instruction or team training sessions that Cutting Edge excels at. Whether you’re looking to improve your skating, stickhandling, passing or shooting skills, Cutting Edge’s training rink provides the ideal dimensions to push you beyond your comfort zone and force you to execute every skill at top speed, as the modern game of hockey demands. 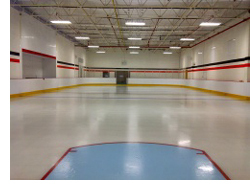 Cutting Edge also offers a massive 35′ x 60′ real ice shooter pad featuring six goal creases. The shooter pad is ideal for goaltending and shooting instruction, and also for small group rentals. Contact Us for availability and to book your rental.